﻿ Green Good - Eat less processed food. The more "processed" a food is the more energy has gone in to producing it. Most energy is created via the burning of fossil fuels, and so we get a negative environmental impact. One method to make food greener is to lower its carbon footprint. Consumer are they key here. . that's you! 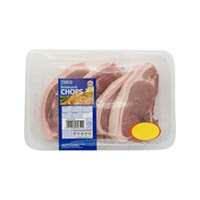 "changes to methods of food processing, packaging and distribution could also help to reduce fuel consumption"
"the consumer is in the strongest position to contribute to a reduction in energy use"
Un processed pork belly, a cut of meat that is underused in the UK. Most consumers plump for roasting joints and chops, and demand for belly meat is low. 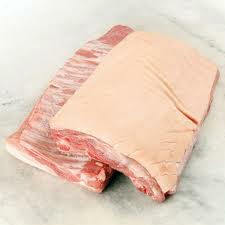 Buy pork belly to support farmers, and prevent waste. Avoid packaging if possible, buy from a butchers, buy locally sourced produce. Middle Ground, ok so it still looks like meat but look at all of that packaging. Probably sourced from out side the UK, where welfare standards are low. Likely to farmed intensely, resulting in point source emissions in to the environment. Highly processed, lots of packaging. Not only is this type of food bad for the planet, it is bad for you too. A real mystery why these still exist. Meat probably sourced from outside the EU, chock full of preservatives. One plus point is that food like this uses up all teh last bits of the pig, ears, snout, tails etc. So very efficient I guess. Make you own Apple Juice: This is a good article from George Monbiot's blog, and explains how make you own apple juice.